Spider-Man is not the man he once was. His ego is bigger. His technology is stronger. He's better than he was before. ...Or is he? When his mind is not his own, Peter Parker needs to find a way to regain control. This is the second Superior Spider-Man Minimate - the first, wearing an earlier costume, came with the version of Nova that had no accessories. This is his second costume, which looks even more like Alex Ross's movie design. It's got the black lenses in the mask (though painted with big highlights so they don't look flat), the big spider on the chest and back, and some grey muscle details. The set also includes an extra unmasked head showing a totally smirky Peter Parker head, with a Bluetooth headset. 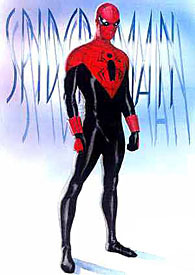 Given electrical powers in an attempt to replicate Captain America's Super-Soldier serum, Max Dillon became an enforcer for the Kingpin, where he frequently faced off with Spider-Man, as well as the Ultimates. Yes, this is Ultimate Electro, meaning these two characters have never met. 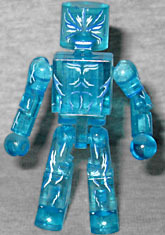 He's cast in translucent blue, because Ultimate Electro turns into pure energy, on the surface to create his face and a little bit of rather than just channeling it. It makes for a very cool-looking Minimate, and has black and white lines body detailing. 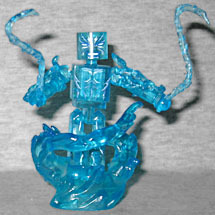 To really show off his powers, he gets a bunch of trans blue add-ons: lightning sleeves, electric whips, and a blue version of "Flame On" Human Torch's swirling base. He looks dangerous! Unfortunately, his hands fall out of his arms pretty easily, so you'll need to watch out for that.